“Final energy consumption” 😀 You are very mean Robert, at least you could have used the Electricity consumption, but then we would have noticed the significant growth reduction in the latest years. It is entirely appropriate to express this trend in terms of final energy consumption, as it is this consumption which results in the majority of emissions. Adding solar capacity is not an end in itself, but is supposed to displace emissions-intensive forms of energy production. Or has it indeed become an end in itself? Sadly it seems some commentators have come to think so. This is obviously the direct result of the austerity policies the Germans pushed on themselves and the rest of Europe. Which goes to show that austerity is just plain wrong: it is bad for the people and it is bad for the environment because it limits the investment needed in clean technologies. Usher in an era of 5% yearly growth which, considering the technological complex we live in is a strict minimum for any decently-managed modern economy, and solar power could reach 20/30% of the total energy consumption in a few years. Sorry folks, but in 2010 Europe chose to go back to the Middle-Ages! I don’t know where to begin in responding to this. 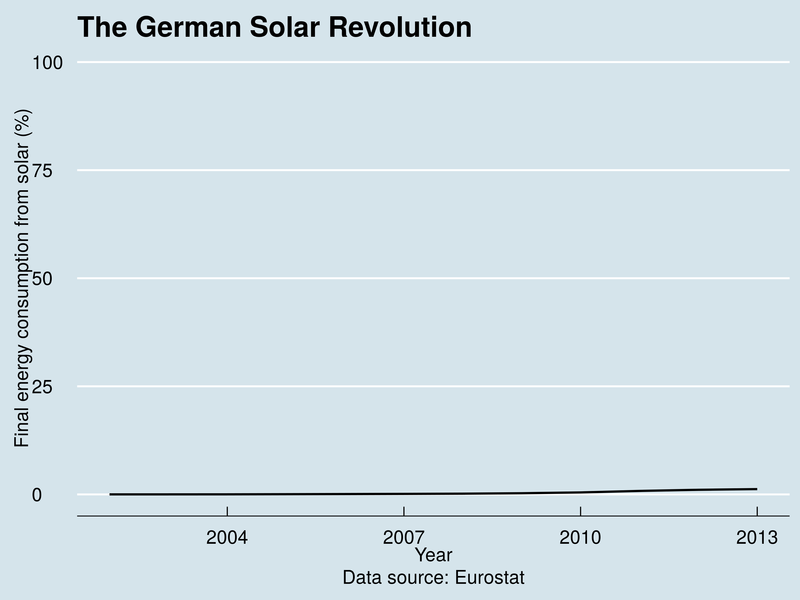 20-30% solar in Germany in a few years is not even mildly plausible. 1) Mankind must use less energy, not more (and if solar/wind are the only allowed solutions, then plenty of us are going to freeze). Passive solutions like improved insultation can save plenty energy. 3) Less use of technologies that use combustion. Whether or not global warming is happening, the percentage of CO2 has run from .293% to .4% from the start of the Industrial revolution. That means the composition of the atmosphere is changing.